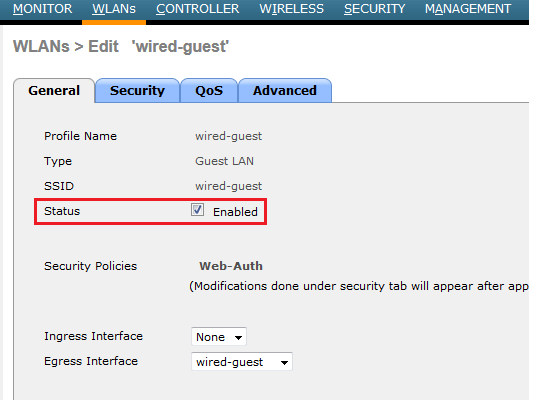 Like we configured guest access service for wireless users, same feature can be extended to wired guest users using WLC configuration. In this post we will see how to configure this Wired Guest Access service. 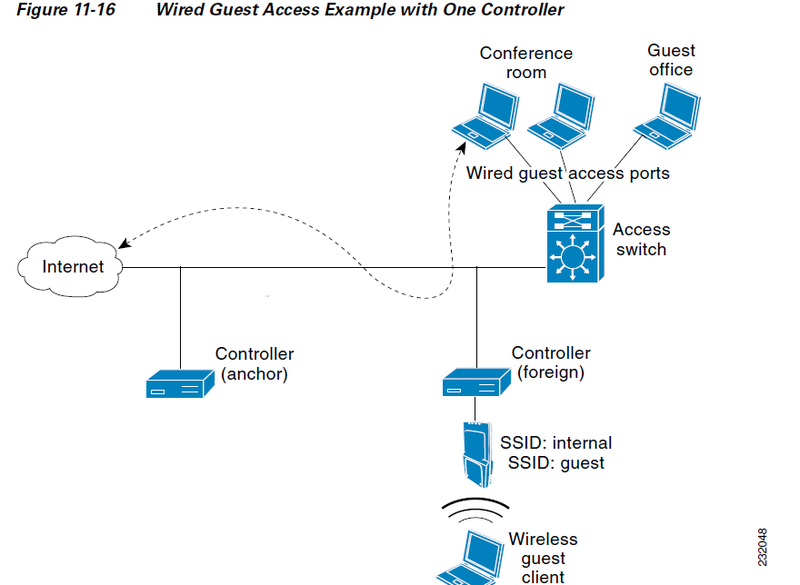 A single WLAN controller (VLAN Translation mode) – the access switch trunks the wired guest traffic in the guest VLAN to the WLC that provides the wired guest access solution. This controller carries out the VLAN translation from the ingress wired guest VLAN to the egress VLAN. 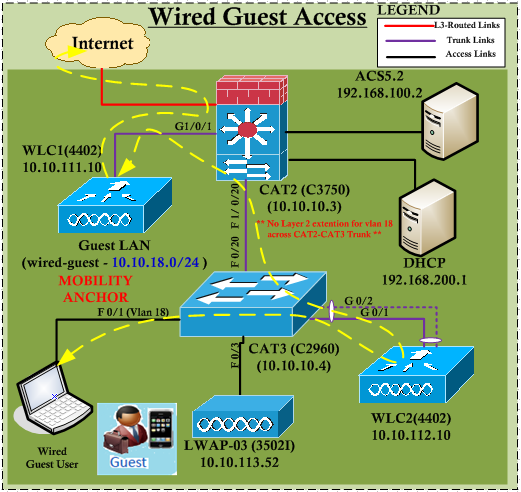 Two WLAN controllers (Auto Anchor mode) – the access switch trunks the wired guest traffic to a local WLC (the controller nearest to the access switch). This local WLC anchors the client onto a DMZ Anchor WLC that is configured for wired and wireless guest access. After a successful handoff of the client to the DMZ anchor controller, the DHCP IP address assignment, authentication of the client, etc. are handled in the DMZ WLC. After it completes the authentication, the client is allowed to send/receive. Ideally your Mobility Anchor WLC will be in DMZ & foreign WLCs will be inside of your network. Therefore vlans defined on your inside network is not span into DMZ. In CAT3 switch configuration should look like this. 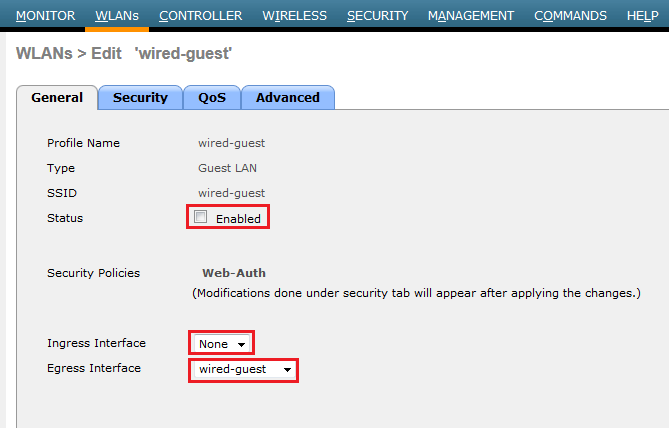 Now in WLC2, you can first define a “wired-guest” interface. Ensure you tick “Guest LAN” option as shown in the below. Then you need to create a WLAN to support these wired guest users. Type should be “Guest LAN” in this scenario. You can define 5 different Guest LAN on your controller & there for ID number should be between 1-5. In the WLAN edit page you have to select “wired-guest” interface you created as ingress interface & any other interface as egress (Usually keep management as egress interface). L3 Authentication can be Web-Auth, Pass through or None. In my example I kept it as WebAuth. Since I have configured my users on ACS, I have added it as AAA server. Then ensure Anchor Controller is added to mobility list. 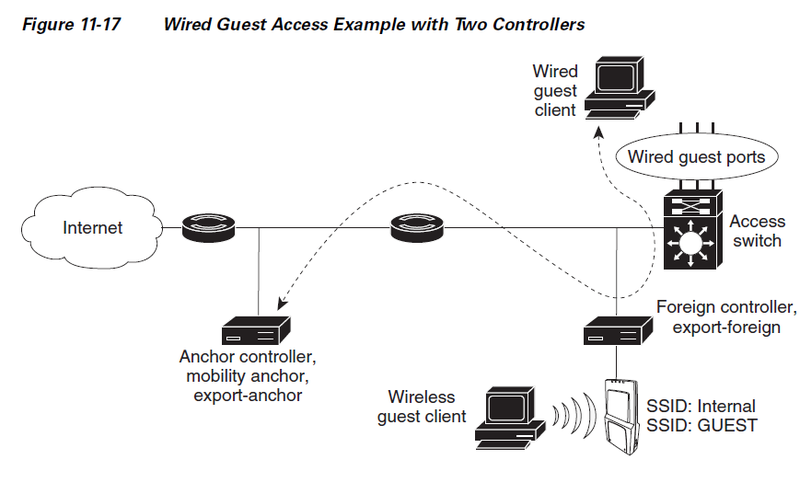 Then you need to configure “wired-guest” WLAN for the mobility anchor as shown in the below. Now you have to configure Anchor Controller (WLC1). In WLC1 you have to create same Guest LAN (wired-guest) and map into dynamic interface where clients can obtain IP addresses through a DHCP server. So first step is to create the dynamic interface on WLC1. Once you create an interface, you can define a WLAN for this(Guest LAN type) as shown in the below. This WLAN should have identical settings to the WLAN defined on foreign WLC (WLC2 in my example) other than the dynamic interface maps to it. Map the interface created as “egress interface” & keep the ingress interface as none. Ensure same layer 3 security & other settings configured as WLAN you created on WLC2. Until you configure the Mobility Anchor for this WLAN you cannot enable this WLAN as it gives error stating “ingress interface cannot be none”. Therefore you have to configure Mobility Anchor before enabling this WLAN. Since this is anchor WLC we have to anchor this WLAN into same IP. Then you can enable this WLAN on your anchor controller as shown in the below. Now it is ready to test.Like in Wireless Guest Access , once you get an IP & try to browse internet you will re-direct to a portal where you can enter the username & password. Once that success, you can browse internet. If you look at client association on WLC1 you would see something like this. Note that protocol shown as 802.3(Mobile) indicate it is wired anchored client. Here is detail of the client connectivity. 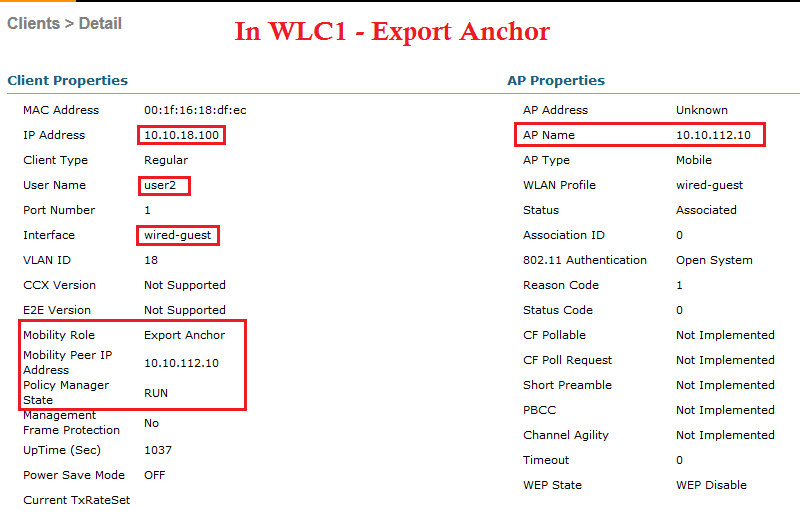 Note that user details, IP information available at Export Anchor WLC. Here is the information available at Expoert Foreign WLC. 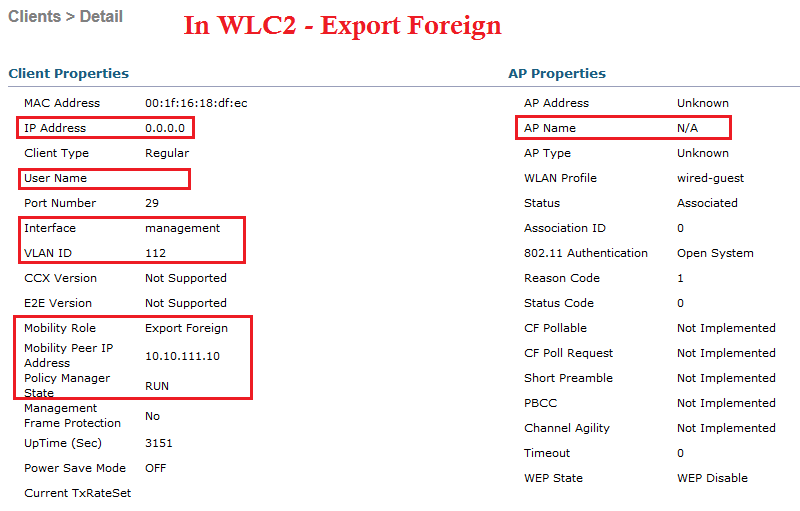 See that no IP information, User detail available to WLC2. *apfReceiveTask: Mar 26 18:25:45.312: 00:1f:16:18:df:ec apfMmProcessCloseResponse (apf_mm.c:485) Expiring Mobile! *pemReceiveTask: Mar 26 18:25:45.315: 00:1f:16:18:df:ec 0.0.0.0 Removed NPU entry. *DHCP Proxy DTL Recv Task: Mar 26 18:26:10.798: 00:1f:16:18:df:ec Static IP client associated to interface wired-guest which can support client subnet. *DHCP Proxy DTL Recv Task: Mar 26 18:26:10.805: 00:1f:16:18:df:ec DHCP success event for client. Clearing dhcp failure count for interface wired-guest. *pemReceiveTask: Mar 26 07:28:32.969: 00:1f:16:18:df:ec 0.0.0.0 Removed NPU entry. 1. Currently, five Guest LANs for wired guest access are supported. In total, 16 WLANs for Wireless users and 5 WLANs for wired guest access can be configured on the Anchor WLC. No separate tunnels exist for WLANs. All the guest WLANs, which include the WLANs for wired guest access, use the same EoIP tunnels to the Anchor WLC. 2. 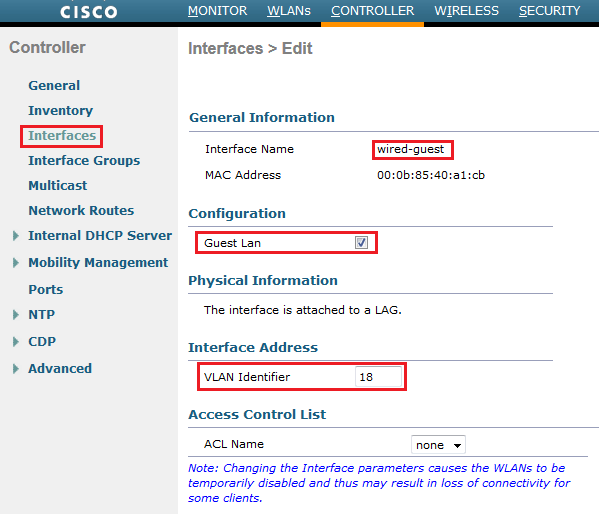 Administrators need to create dynamic interfaces in the WLAN controller, mark them as “Guest LAN,” and associate them to WLANs created as Guest LANs. 3. Make sure that WLAN configurations, including authentication, are identical on both the Anchor and Remote controllers to pass the client traffic. 4. WLCs should have compatible software versions. Ensure that they run the same major version. 5. Web-authentication is the default security mechanism available on a wired guest LAN. The current options available are these: Open, Web Auth, and Web Passthrough. 6. In case of failure of the EoIP tunnel between the remote and anchor WLC, the client database is cleaned up from the Anchor WLC. The client needs to re-associate and re-authenticate. 7. No layer 2 security is supported. 8. Multicast/Broadcast traffic on the wired guest LANs is dropped. 9. 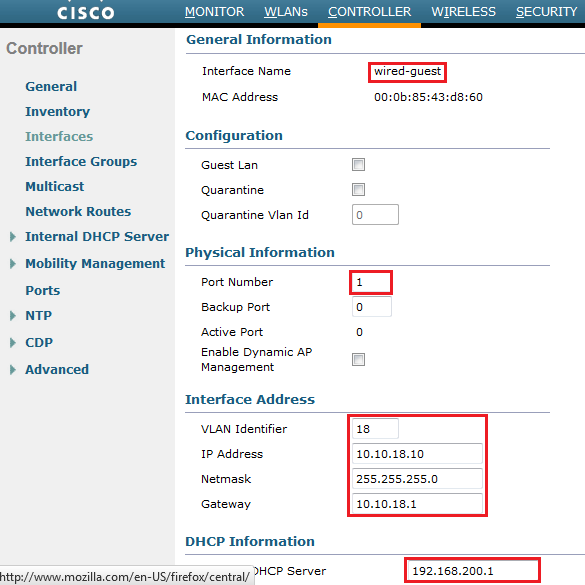 DHCP Proxy settings must be identical on both the Anchor and Remote controllers. Here are the few reference documents discuss about this. Thanks a lot for the amazing post. I’m confused about something. How the wired guest users traffic will be directed from their PCs to the Foreign WLC Guest Dynamic Interface? Also, why you configured a AAA on the Guest WLAN on WLC2 while WLC1 should be handling all the Authentication stuff? I thought that this should be configured on WLC1 only. Or should it also be identical on both WLCs?